This worksheet will give your child some important reading comprehension practice that also combines imagination and the fun of drawing! Try a Halloween-themed reading and problem solving game for kindergarteners. Practice identifying nouns and adjectives while building reading skills with these heartfelt Valentine's Day sentences. Solve a Halloween riddle by reading clues and figuring out the names of these costumed kids. 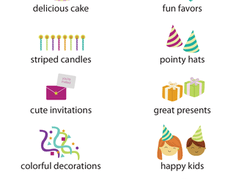 On this birthday-themed second grade reading worksheet, kids circle the adjectives and underline the nouns. With this reading worksheet, your child will learn all about mummies. Compare witness accounts of these weird waters and draw your own conclusions in this reading worksheet. 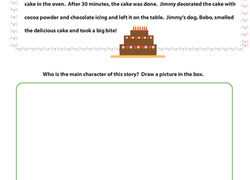 Kids will respond to the reading with some comprehension questions. Your kid won't have to be coaxed into reading with this fun activity. Help him hunt down and circle words associated with Christmas. Kids can identify parts of speech and hone reading skills. He'll have a spooky story to share with friends, and get some reading practice, too!